First video of a live giant squid: Edith Widder uses bioluminescence to understand oceans. Edith Widder uses light to communicate with mysterious animals in the deep sea. Dr. Edie Widder, President and Senior Scientist at Ocean Research & Conservation Association (ORCA) inside the deep diving suit WASP. Deep-sea biologist Edith Widder was working on a ship positioned off Japan’s Ogasawara Islands when Wen-Sung Chung asked her to step into the lab to see something. Cameras followed her as she got up. This was not unusual, since the Japan Broadcasting Commission (NHK) and the Discovery Channel were funding the expedition, which was being conducted from a research yacht named Alucia leased from a billionaire hedge fund owner. Chung was nonchalant, so it didn’t occur to Widder that she was about to see the culmination of a quest that has driven ocean explorers for more than a century. She thought maybe it was going to be video of a cool shark. The purpose of the expedition was to capture footage of the enigmatic giant squid in its natural habitat. The animal can grow to 35 feet or longer, and its eye is as big as your head. But it lives about 1,000 feet below the surface and deeper, and it had only been glimpsed a few times at the surface and photographed alive once. Widder is a world expert on bioluminescence, the light that countless marine animals use to communicate, especially in the dark world of the deep sea. For years she’s been studying how the deep’s bizarre inhabitants use the light. Some animals use it to lure a mate, others a meal. And she suspects that certain jellyfish pulse with bioluminescence when they are getting attacked. It’s a last-ditch attempt that works sort of like a burglar alarm to bring in something even bigger to attack the attacker. Widder has spent months of her life underwater, at times piloting submersibles. For years, she has argued that scientists were getting at best a tilted view of the wonders of the deep sea. By going down with robotic vehicles or in submersibles with lights blazing, she and others have reasoned, they were scaring lots of good stuff away. Deep-sea animals barely see any light, so a typical submersible dive is the equivalent of coming into a darkened theater and shining a spotlight at the audience. Everything bolts. Then she added bait. The system, called Eye-in-the-Sea, is fitted with a device that mimics the ring of blue lights fired in a marquee pattern by certain jellyfish—the ones she thinks do the burglar alarm trick. She deployed the system for the first time in the Gulf of Mexico. Just 86 seconds later, a large squid darted into view; it was a species new to science. Widder brought a more advanced version of that system, dubbed Medusa, aboard the Alucia. She hoped the secret weapon would attract a giant squid. They hung it about 2,300 feet down from a surface buoy and left it running for hours. The giant squid has been the stuff of legend for about as long as people have sailed across oceans. Aristotle and Pliny the Elder described what may have been giant squid, which occasionally wash ashore or end up in fishermen’s nets, and the species is thought to be the origin of the Norwegian kraken myth. Countless groups in past decades have tried to manufacture giant squid encounters, investing millions, getting all the best advice from the experts, only to come back as failed crusaders. One of the other scientists aboard the Alucia, Tsunemi Kubodera of Japan’s National Museum of Nature and Science, has been hunting giant squid in these waters for years. He managed to capture some still images of one giant squid and video of another after it was caught and brought to the surface. But none of that could compare to video of the animal alive in the deep, a view that would finally allow scientists to begin to understand the mysterious animal. Watch a 10-second clip of the giant squid. The expedition leaders didn’t tell the crew what had happened at first, because they were headed to port for the Fourth of July and feared that too much drinking and talking might lead to a breach of the news they hoped to keep secret until they could get documentaries out. NHK and Discovery couldn’t have asked for a more dramatic story to unfold over the coming days if they had trained giant squid and given them a script. Medusa had a total of five encounters with the giants, and each time they showed just a little more leg. Several days after the first encounter, a squid came into full view, arms waving, attacking Medusa. Widder says the sighting supports her burglar-alarm hypothesis—the squid didn’t go after the eJelly that was producing a mock alarm signal, but the big thing close to it. This expedition is likely to focus more attention on Widder than she’s ever experienced, but she has had her share. A TED talk a few years back led to her involvement in the expedition, and she has another one coming up. In 2006, the MacArthur Foundation awarded her one of their “genius grants.” Stephen Colbert mentioned her on his show and even mocked her a bit because, he felt, he should have gotten the half-million-dollar prize for his own “deep” explorations. Now Widder is the first person to capture footage of a giant squid in its natural habitat. But even she admits that the grainy black-and-white footage, by itself, would have been a little unsatisfying. Some high-def footage would be the ultimate satisfaction. The drama-savvy squid would come through again. Seven days after the first Medusa footage of a giant squid, Kubodera was in the clear sphere of a Triton submersible with pilot Jim Harris and NHK cameraman Tatsuhiko “Magic Man” Sugita when it happened. Kubodera was exploiting a different hypothesis: that the elusive squid find their prey by looking up with those huge eyes to see the faint silhouette of prey. On Kubodera’s dives, the team tied a smaller, diamondback squid to the front of the sub and wrapped the bait around foam so that it would sink slower. Up and down, up and down the sub had gone for hours, using another low-light camera. A giant squid latched on at 2,000 feet. As it drifted down, Harris matched the descent to keep the squid in full camera view. After the first few minutes they had flipped on the big lights, thinking the squid would flee, but it was committed to the bait. 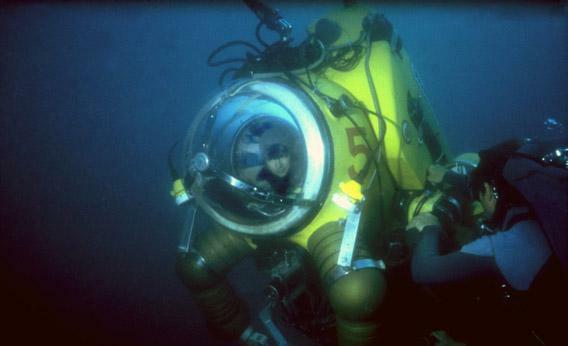 The sub’s maximum safe depth is 3,300 feet. Had the squid held on that far, Harris would have had to hit the brakes and the squid would have dropped out of view. But instead, at the last minute—3,000 feet—the squid swam off, so they got the entire encounter on film. “I’ll never forget how beautiful it was,” says Harris. “It looked like it was covered in gold leaf.” That was a surprise to everyone because the dead ones certainly hadn’t looked like that. They were pasty. Kubodera says it was like seeing an entirely different animal. During the encounter, the ship called down for a status report. Harris said it would have to wait because they were in the middle of filming a giant squid. At first, no one topside believed them. The full event took 23 minutes. “We couldn’t imagine what it was doing that it would be on-camera for that long,” says Widder, who was in the ship’s control room. When the trio finally surfaced, it was like a victory parade, with shouts and applause. Kubodera thinks that the giant squid’s approach to both Medusa and the sub bait support his silhouette hypothesis. Widder points out that in addition to the bait they used to create the silhouette, they also had a lighted squid jig on the sub like ones that local fishermen use. No one can say what the most critical element was. But some combination of light, silhouettes, and perseverance was enough for the expedition to make history. For Widder, deep exploration remains a delight, but it’s no longer the primary focus of her career. In 2005, she left her longtime research post at the Harbor Branch Oceanographic Institution to found the Ocean Research and Conservation Association, headquartered in a scenic old Coast Guard station on the Fort Pierce inlet. She wanted to take a step away from academia, where scientists are expected to stay relatively quiet in public and avoid anything that smacks of activism. Widder had been growing increasingly overwhelmed by the environmental decline she was seeing, particularly pollution in coastal waters and estuaries, which are plagued by the polluted runoff of a Florida lifestyle dependent on constant growth and lots of fertilizer. ORCA is developing low-cost, compact water-quality monitoring systems that can be deployed for long periods. The devices, dubbed Kilroys, measure conditions like currents and temperatures, which give good indicators of where water is coming from. It has sensors for things like nitrogen and phosphorous, found in lawn fertilizer and sewage and capable of fueling algae blooms and other problems. Kilroys can also collect water samples for more thorough analyses. The group is using bioluminescence to listen to what the ocean is saying. Various micro-organisms throughout most near-shore waters produce bioluminescence, including the bacteria that can turn raw oysters deadly. Bioluminescence sensors in Kilroys could be used to trigger the water sampling. The group is also testing bioluminescence in sediment samples to look for further signs of pollution. Most people assume this kind of water and sediment testing is done by some government agency or other, but in truth it’s quite rare, says Widder. She wants to wipe away the fallacy that pollution is an amorphous, intractable problem by gathering the information needed to pinpoint key problems. The group wants to create the aquatic equivalent of weather maps. Red shows polluted waters, blue the areas in the best shape. If people know the spot their kids swim in is in the red, they’ll take much more notice, she reasons. Perhaps more importantly, tourists would gravitate to cleaner waters if they could, creating a strong motivation for improvements. Already the project has had success. Mapping the pollution in a stretch of Indian River Lagoon—Widder’s home and her office are both on the lagoon—she was surprised to find that two canals came up blue in a field of red. After some checking, the team learned that the golf course on those canals had switched to better environmental practices. They were preventing mowed grass clippings and runoff from the course from making it into the water. It was the perfect example for the local government, and in short order, a new fertilizer ordinance was passed. They seem a world apart, but to Widder, the deep-sea exploration for fantastic creatures and the coastal environmental work guided by microbes are intimately tied. Not just because it’s all one big sea. Attention from the higher profile deep-sea work gives her a bully pulpit for focusing attention on things people don’t want to hear about, like water pollution. “I don’t want to hear about that stuff either,” she says. “But we’ve got to deal with it.” Widder says the deep sea is her first love, but there’s work to be done onshore if we want to preserve the chance to figure out what’s down there. Discovery Channel’s Monster Squid: The Giant Is Real premieres on Jan. 27 at 8 p.m. ET/PT.